Both the Datsun GO and GO+ have been launched in new colour option, "Amber Orange" and "Sunstone brown" respectively, with updated exteriors that add a more imposing stance. Datsun India has finally launched the facelifted 2018 Datsun GO and GO+ models in India. The updated Datsun GO is priced at ₹ 3.29 lakh, while the bigger Datsun GO+ is priced at ₹ 3.83 lakh (all ex-showroom, Delhi). Both prices are introductory. The new GO range has been updated after over four years, which makes it all the more important for Datsun to offer a compelling package, and that is exactly what the carmaker has done. In addition to some considerable cosmetic updates, the new GO and GO+ cars also come with a host of new creature comforts and safety features. Both the Datsun GO and GO+ have been launched in new colour option, "Amber Orange" and "Sunstone brown" respectively, with updated exteriors that add a more imposing stance. Like the pre-facelift models, most of the visual traits are identical, like the new hexagonal black grille with chrome surrounds, and a set of new sweptback headlamps with black highlights and integrated turn signal lights. The front bumper is also brand new and now features a revised airdam with sharp muscular lines and LED daytime running lights as well. Both the cars also get new larger 14-inch diamond-cut alloy wheels as well. Datsun has also updated the cabins of the GO and GO+, both featuring the same design as well. However, the biggest difference between the two cars is the seating capacity. While the former is a 5-seater hatchback, the GO+ is a 7-seater, although technically the last row is still not suitable for adults. That said, Datsun has updated to interior adding a bit of premiumness. The dashboard is all new and features a sporty instrument cluster with trip computer MFD (Multi-Function display), Anti-fatigue front seats with sporty bolster cushioning premium instrument panel, first in segment 7-inch touchscreen infotainment system with Android Auto, Apple Car-play, Google Map navigation, App support & voice recognition technology. 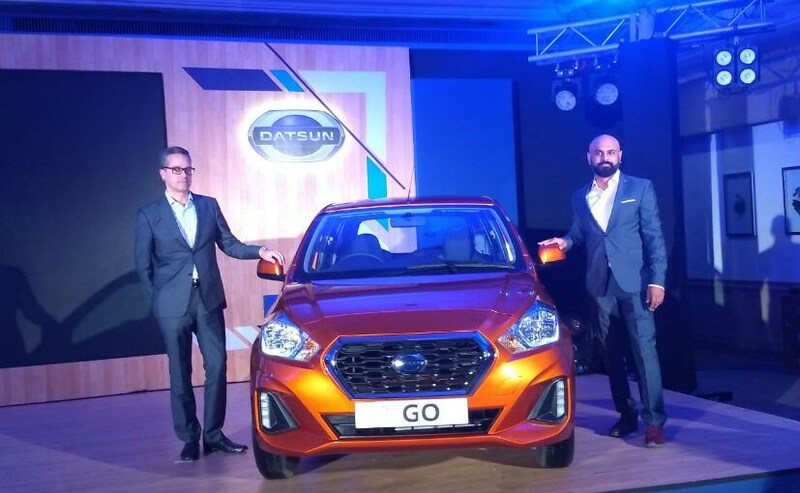 Datsun India has already started pre-bookings for the facelifted GO and GO+, and deliveries will commence from October 10, 2018, onwards. The Datsun GO facelift will rival the likes of the Tata Tiago, Maruti Suzuki Celerio, while the GO+ MPV will compete with the Maruti Suzuki Ertiga.